U.S. Education Secretary Betsy DeVos congratulates Butler Tech student TJ Hollon who will work at ARI-Hetra after graduation. 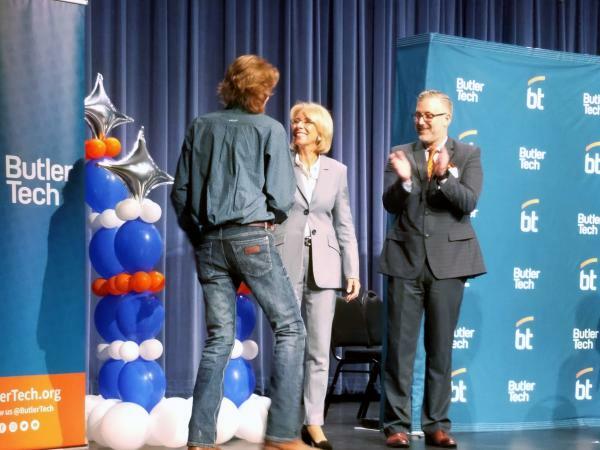 U.S. Education Secretary Betsy DeVos made a swing through Ohio Friday to visit students at Butler Tech, a career and technical school in Butler County. In an event similar to a sports signing day, more than 30 students announced post-graduation jobs with local manufacturers. DeVos stayed away from political comments. She highlighted two of the student's achievements, offered advice for succeeding in the working world, and congratulated the students on their hard work. "At some point or another you realized that learning only at a desk didn't work for you, so you grabbed the opportunity to learn differently," she told the students, their families, and local manufacturing company leaders. "Every student in America needs that kind of freedom. What Butler Tech offers isn't yet widely embraced but it should be." The students were signing job contracts with manufacturing companies following successful internships during their senior year of high school. DeVos then toured the school and talked with students about what they've learned. "I love my job," Caitla Rutherford tells DeVos. "Some people don't realize how hard we work so it's nice to be recognized by you." Rutherford will be working at Rubber Duck 4x4 where she does welding and other things for Hummers. Speaking with media following the tour, DeVos said the visit reaffirmed "that every student is different and needs different opportunities. "This administration is going to continue to advance multiple opportunities for students to pursue." DeVos briefly addressed the proposed federal education budget, saying "the budget's presented to Congress and Congress will be soon debating and acting upon it for the next fiscal year." Ohio Democratic Party Chairman David Pepper isn't impressed with DeVos' visit or the proposed budget, which includes cuts to a grant supporting teacher salaries. "Here in Ohio, the proposed cut would be nearly $74 million, which would cover the salary for about 1,300 teachers," he told reporters on a conference call Thursday. "The Trump/DeVos budget also slashes funding for 21st Century Community Learning Centers. These centers provide opportunities for children who come from low-income families to receive academic support outside of regular school hours," he continued. "Under this proposal Ohio would lose nearly $42 million in federal funding for this program under the Trump/DeVos proposal. More than 58,000 kids in Ohio would lose out." Pepper says DeVos has been a "disaster for public education." Copyright 2019 91.7 WVXU. To see more, visit 91.7 WVXU. The U.S. Senate is holding hearings on President Trump’s cabinet picks. And his nominee for Secretary of Education is raising eyebrows because of a court case in Ohio. During a recent teleconference, U.S. Sen. Rob Portman said he couldn’t answer questions about fines owed to Ohio by a political action committee created by Secretary of Education nominee Betsy DeVos. Portman later issued a statement saying he was told DeVos was not a party to this lawsuit. Ohio’s Sherrod Brown is among a group of Senate Democrats urging President-elect Donald Trump’s nominee for education secretary to pay the $5.3 million fine her political action committee owes Ohio.